When asparagus hits the farmers market every spring, it can seem a little like a tornado. Between late February and mid-May, Zuckerman’s Farm brings around 3,000 pounds in from the San Joaquin Delta every Saturday. And if you combine that with the amount the farm sells at the Tuesday and Thursday markets (where many chefs come to stock up for the week) it’s likely that the farm moves between 60,000 and 80,000 pounds of this vegetable in a single season — at the Ferry Plaza alone. But don’t let this appearance of asparagus-fever fool you; the local asparagus market is actually on the decline. Capay Fruits & Vegetables is the market’s only current organic asparagus seller; they devote 20 acres of their farm to the vegetable and sell a great deal of it through their CSA boxes, but they bring a few thousand pounds to the Ferry Plaza each spring. Although it’s a perennial crop, meaning that it reappears every year and doesn’t have to be re-planted, asparagus is incredibly labor-intensive because it has to be harvested by hand. “There are a lot of actions required to make a single bunch,” says Capay’s Freeman Barsotti. Getting an asparagus crop going isn’t easy either. For the first few years, farmers refrain from clipping the spears, which will open if left alone and turn into a fern-like plant. That way, “carbohydrates are stored in the roots over time — and that’s the energy it takes to make the shoots the following year,” says Freeman. Asparagus, member of the lotus family, also requires irrigation to survive through the dry season – so this winter’s abundant rain has been good for the crop. Carlos Zuckerman of Zuckerman’s Farm says he welcomes the heavy rainfall, which has increased the Delta waters surrounding their acreage (the farm is on an ‘island’ in the delta formed by the San Joaquin and Sacramento rivers and is surrounded on all sides by levees). The farm should now have enough water to last them through the summer. Some reporting for this article was done by Kenrick Mercado. 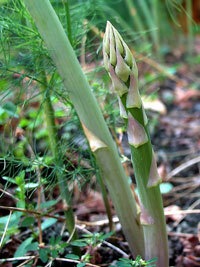 Asparagus (growing) photo by Rob Ireton.